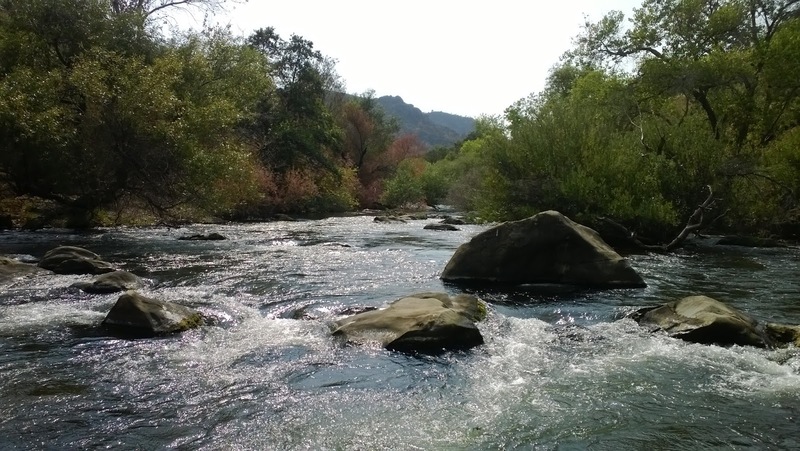 When it was discovered that trout in Putah Creek were able to spawn successfully, a campaign was launched by local agencies, guides, and anglers to protect these wild self-sustaining fish. 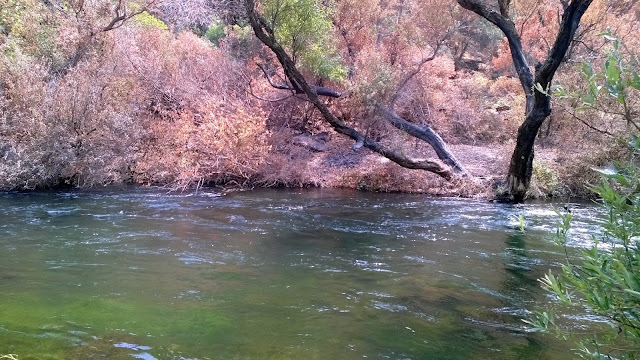 In 2010, Putah Creek was officially designated as a catch-and-release fishery and only barbless artificials can be used. Putah Creek remains the only wild and scenic fishery west of valley. Prior to these new regulations, the creek was once stocked with hatchery rainbows and brown trout. The rainbow trout in Putah Creek are a bit of an anomaly because they can grow to huge sizes despite living in a 4.5 mile stretch. Many have theorized that these big rainbows are the genetic cross between steelhead trout and ancient coastal cutthroat trout that hybridize a long time ago. But who knows? This trip was my second attempt in trying to catch a Putah Creek native. The number one reason why anglers ignore Putah Creek until fall is because of the flows. From about April/May to September the flows stay around 500-600 CFS which is very high. Ideally the flows that you want to fish are below 250 CFS. Today I fished 480 CFS flows which was fishable but still high. 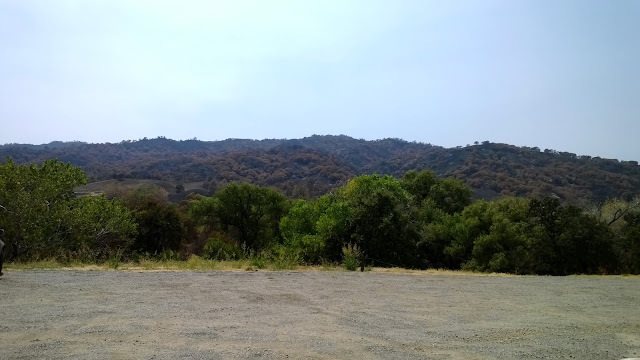 A few weeks ago there was a huge fire, named the Wragg Fire, that set the Putah Creek Wildlife Area blazing. The Wragg Fire burned thousands of acres and was one of the most destructive fires of this year. Unfortunately Putah Creek was also caught in the fire leaving access 5 and 4 burnt out and access 3, 2, and 1 in poor condition. The majority of the creek opposite to HWY 131 (Solano County) was scorched during the fire. The outcome of the Wragg Fire may possibly create future issues for the creek in the form of sediment accumulation and erosion. In my mind I figured it would probably better to fish it now rather than later. Putah Creek is truly a puta to fly fish. There were very few access points at these flows and wading was difficult due to high water. There is literally no room to backcast without getting snagged on Putah Creek, therefore knowledge and skill of roll casting, snap-t's, and double speys will save you the frustration of undoing a snag. The fish are also known to be very finicky eating very small size 18-22 nymphs. The trout per mile at Putah feels moderate making them somewhat difficult to find. The only flies I planned on throwing into Putah this trip were streamers. When I arrived at the creek, I fished it hard, throwing my pattern into every nook and cranky I could cast to. Throughout the afternoon I had three follows and one attempt. Nothing landed yet. My hopes of ever holding a Putah Creek bow was slowly starting to fade away. But I kept calm and fished on. My luck finally came through when I hooked my first fish and it's a big one! I played the fish carefully as it made a big jump and ran downstream a few times. 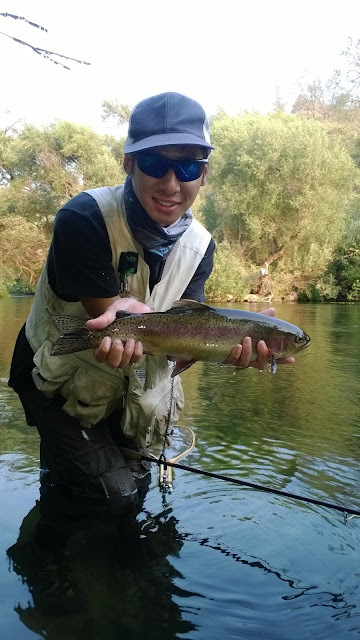 After a few minutes of play, I had finally landed my first Putah Creek rainbow. A big dark beauty! As the sun started to go down, I had some hopes of catching a few more fish but it didn't happen. There were a few smaller trout that were rising for size 24 midges but nothing big. Overall, this trip was totally worth the hour drive. Now that I live a bit closer to the creek, I am looking forward to mastering it. A lot of information about the creek isn't updated. But to all of you who didn't already know, the parking access is free. No $4 fee is required anymore.